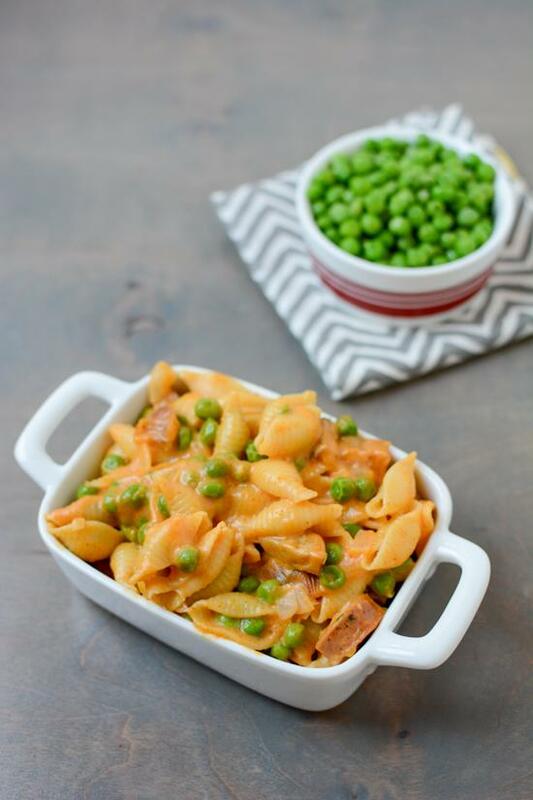 This recipe for Stovetop Mac and Cheese with Sausage and Peas is an easy, kid-friendly dinner idea for a busy night and the leftovers work well for lunch! Thanks to the Healthy Aperture Blogger Network and PastaFits for sponsoring this post. Story time. When I was in high school, my parents went to dinner pretty much every Friday night. Although there were times my sister and I accompanied them, more often than not I chose to stay home. I was in high school. Dinner with your parents was so not cool, right? Anyways, since I was perfectly capable of navigating the kitchen at that age, feeding myself dinner became my responsibility. I’m going to let you in on a little secret. I ate the same thing for dinner pretty much every Friday night for 4 years. Any guesses what it was? Plain pasta with butter and salt. I, the now Registered Dietitian, ate buttered noodles for dinner once a week while growing up. And I loved it. It’s no secret that I love pasta. It cooks quickly, can be used in a wide variety of recipes and is quite affordable. And while lately it may seem like everyone you know is shunning carbs, I’m here to tell you that pasta can most certainly be eaten as part of a balanced diet. Key word is balanced. I would not recommend taking after my high school self and choosing a huge bowl of plain, buttered noodles with salt for dinner. Choose whole wheat pasta to help get your daily servings of whole grains. Be aware of portion size. A serving of cooked pasta is about the size of your fist and typically has 7g of protein and 200 calories per serving. Add veggies and protein to bulk it up. By doing this, you can enjoy a nutrient-rich dish that’s healthy, filling and full of flavor! So that brings us to this mac and cheese. When I felt like getting fancy on a Friday night, I’d make a box of mac and cheese instead of just plain noodles. It’s one of the ultimate comfort foods for me…and probably a lot of other people. Fast forward to today and now, at the wise old age of 30, I now typically put a little more effort into making my mac and cheese and try to focus on making it more of a complete, balanced meal. I always add veggies – frozen veggies are perfect for this. I usually throw in a protein source – chicken, pork, sausage, beans, etc. I make my own cheese sauce. That may sound like a lot of extra work, but I promise it’s not. This recipe can all be made in one pan. I used pre-cooked chicken sausage but you could use any leftover meat you have on hand, or even tofu or beans. Added bonus- customize with your favorite veggies. I love adding peas to mine, but broccoli or a bag of mixed veggies would also be great! 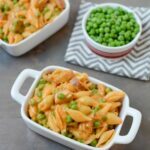 Made in just one pan and ready in 25 minutes, this recipe for Stovetop Mac and Cheese with Sausage and Peas is an easy, kid-friendly dinner idea for a busy night and the leftovers work well for lunch! In the same (now empty) pan, melt butter. Add onion, garlic, peas and sausage and saute for 5 minutes. Add flour, milk and seasonings and let simmer for 2 minutes. Stir in cheese and 1/2 cup pumpkin. Taste, adjust seasonings and add more pumpkin if desired. Now don’t go freaking out because there’s pumpkin in there. It is optional, but I’d highly recommend adding at least 1/ 2 cup. I’d wager you won’t even know it’s in there. So start with 1/2 cup and then add more if you want. I use a full cup. I also make mine extra spicy! Another note- you’re more than welcome to cook the pasta in one pan and start on step two in another pan while the noodles are cooking. This will save time. It will also dirty another pan. Your call. 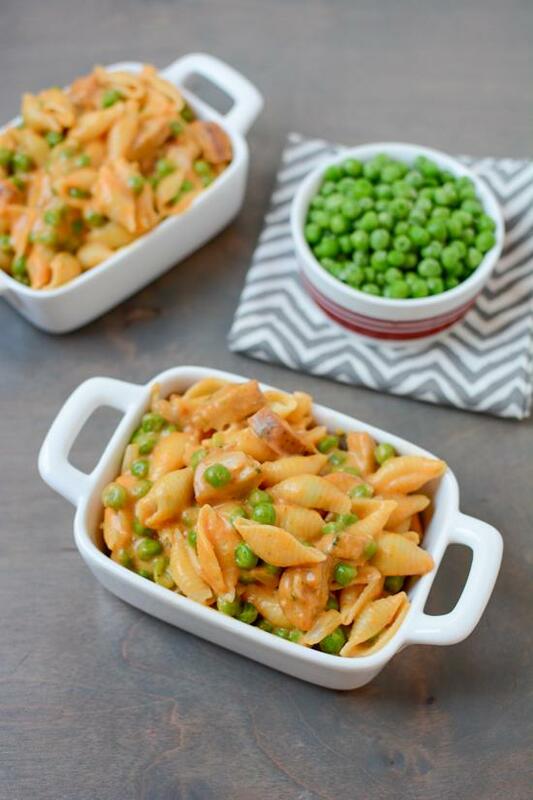 This Stovetop Mac and Cheese from @leangrnbeanblog is quick, easy and kid-friendly! For more delicious pasta recipes, visit PastaFits.org. woa, pumkin mac! I have never seen that before. I will have to try. Does it still taste cheesy? I’m totally with you on the added veggies and protein to pasta. Complete, balanced meal. This looks amazing! I’m totally trying this recipe soon. I love adding veggies in sneaky ways to my food to make it healthier. I’ve actually never added pumpkin to my mac, but I’ve tried butternut squash and loved it so I’m sure this will be delicious! This looks amazing! I love your tips for eating pasta. My husband loves pasta and I always try to avoid it because I feel like there are much more nutritional options for dinner. But, your tips for adding veggies and protein and sticking to the serving size are great! I might have to surprise my husband and make him this recipe this weekend. can’t ever go wrong with mac and cheese! and i love adding peas to pastas! There was pumpkin in there!? Get out of town. I housed a huge bowl of it and had no idea. I lived on pasta with butter and salt in college. It’s so good. I am a sucker for Mac and cheese and this recipe looks perfect. I also ate buttered noodles growing up. SO good. And I love the sound of this! Pinning! Mmmm…. This looks so good! & I love that I can easily make it vegetarian 🙂 Thanks for sharing this delicious recipe! Linds I’m shocked you gave up the beloved spiralizer for this recipe 😉 Although totally team pasta with butter and salt growing up. This looks awesome, and looks like a recipe my kids will love! Pinning for later as this is the perfect comfort meal for a cold winter night…Thanks for sharing as ALWAYS! Sitting at work… starving… wanting to sink my face into this. Omg I also used to eat so many plain pastas w butter and salt. They are so delicious! Such a great weeknight dish – and absolutely kid friendly and mama approved! Great color from the pumpkin! 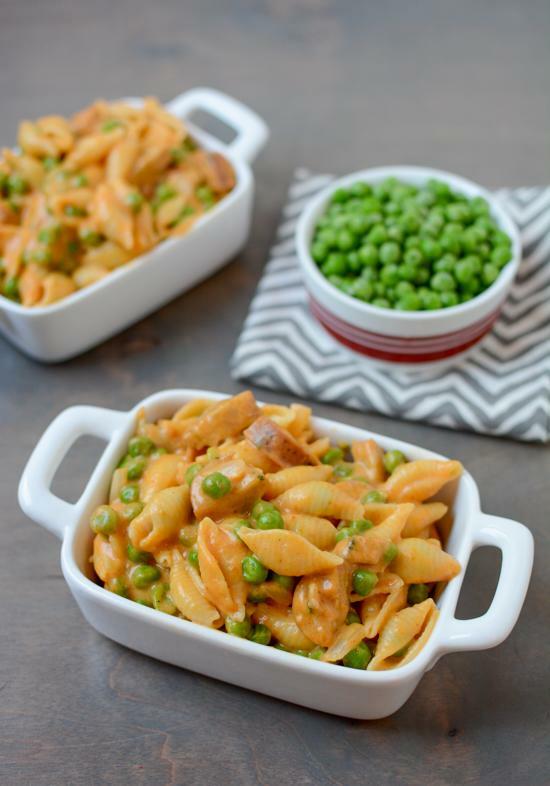 Terrific kid -friendly, easy to make, and protein and vegetable enhanced mac & cheee. Mac and cheese is one of my favorite comfort foods! I’ve never tried it with sausage though, so maybe I will give this a try! My favorite is black beans, corn, and tomatoes for a Mexican-style mac! I made this the other night (I actually doubled the recipe to feed a crowd) and it turned out FABULOUS. I will be making it again next week. Was seriously so delicious and super easy. I just microwave it and it does fine. Your post on how to help bloggers coincided with my making this recipe for the 100th time and made me think I need to comment on this recipe. This is a favorite with my 6 and 7 year old. We were eating it last night and my daughter was going on about how delicious it is, and I said, “It is one of your favorites, right?” She answered, “It IS my favorite!” I make it with lentil pasta from Trader Joes for extra protein. Sometimes I use sausage and sometimes we use chick peas or white beans. It is a staple in our house! oh i’m so happy to hear that 🙂 love the lentil pasta idea! !